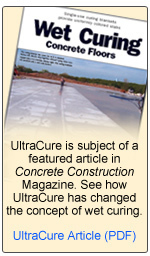 To achieve optimal performance of the UltraCure™ product line, it is essential that proper installation techniques are performed. The online version of the installation procedures are below. For a printer friendly version of the instructions, Click Here to download a PDF. Note: you will need the Adobe Acrobat PDF reader. Click Here to download Acrobat if needed. The videos below are compressed for broadband connections. Contact Us for CD or DVD version. The procedures below are applicable for UltraCure NCF, UltraCure SUN, UltraCure MAX, and OneCure. IMPORTANT note: OneCure is designed for short curing durations (3 days). 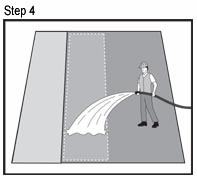 Spray water on and around the first area that will be blanketed with UltraCure NCF™. At least 1/8-1/4” of water is required. Llene de agua el área que va a cubrirse con UltraCure NCF™. Se necesita por lo menos 1/8 – 1/4” de agua. 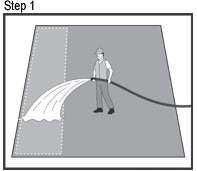 Place the UltraCure NCF™ roll on the wet surface plastic side up, absorbent fiber side down. Un-roll the UltraCure NCF™ blanket in a straight line. Spray additional water as needed. 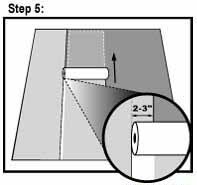 If wrinkles occur, or the roll becomes out of line, cut the blanket straight across, realign the roll, and continue roll out. Coloque el rollo de UltraCure NCF™ encima de la superficie inundada, el lado plástico hacia arriba, y el lado con fibra absorbente hacia abajo. Desenrolle la cobija de UltraCure NCF™ en una línea recta. Rocíe agua si es necesario. Si hay arrugas o el rollo sale de línea, corte la cobija recta realinee el rollo y continúe desenrollando. 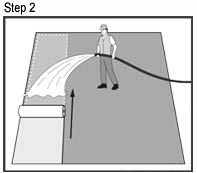 Using the UltraCure NCF™ Squeegee (or similar squeegee), smooth out wrinkles and air pockets. 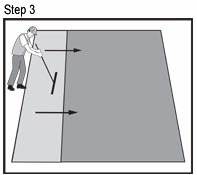 Be sure and squeegee toward the un-blanketed portion of the surface. Usando el de escurridor UltraCure NCF™ (o uno similar), suavice las arrugas y bolsillos de aire. Asegúrese de escurrir hacia la porción descubierta del superficie. Roll out the next layer of UltraCure NCF™. 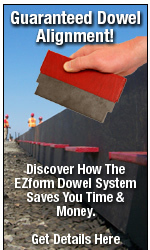 Be sure to OVERLAP THE PREVIOUS ROLL by at least 2” to 3”. Desenrolle la proxima capa de UltraCure NCF™. Asegúrese de traslapar el rollo anterior por lo menos 2” a 3”. Repeat Steps 3 through 5 until the entire surface is blanketed. Repita los pasos 3 a 5 hasta que toda la superficie esté cubierta.